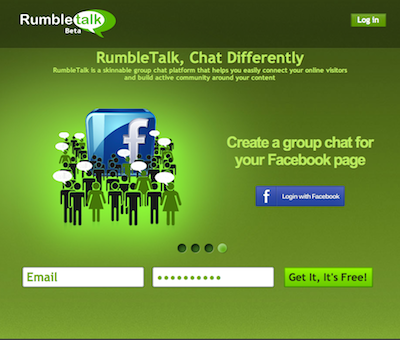 RumbleTalk is a skinnable group chat platform that helps you easily connect your online visitors and build active community around your content. Embed the chat in minutes in your website, blog, forum or even at your Facebook page. Users can choose from various chat skins or may design a custom skin to match exactly the website look and feel. Social – one may give their audience the ability to retweet interesting lines from the chat or repost them on Facebook.